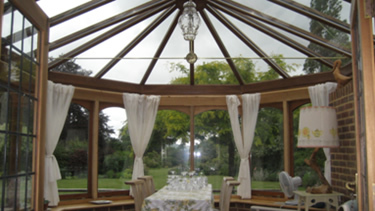 “The difference is so noticeable that before we didn’t use the conservatory much in the winter. Now I have my breakfast in it at 5am winter and summer”. 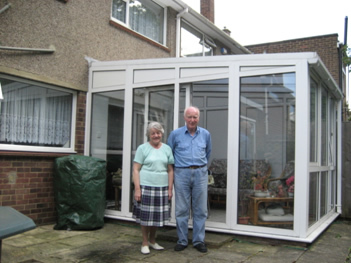 After: Mr and Mrs Green outside their refurbished conservatory. 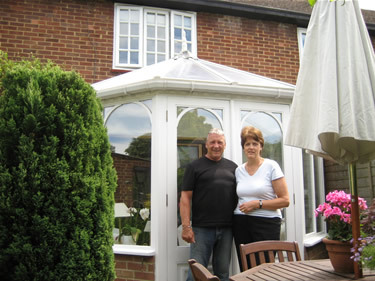 When even your neighbours think your conservatory is an eyesore, it’s time to call in the experts. That’s exactly what Mr and Mrs Green did when they moved into their Surrey home five years ago. The roof of Baltic southwest facing pine conservatory was – not to put to fine a point on it – rotten! The wood was in such a state that when Mr Green tried some DIY he decided the roof was beyond salvation. He called in HTG to assess what was needed. 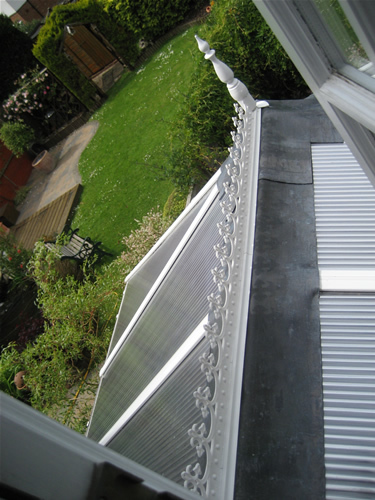 The remedy was to remove all the external elements and replace with a high performance HTG polycarbonate roof, and to provide a new ridge, crest and finial. 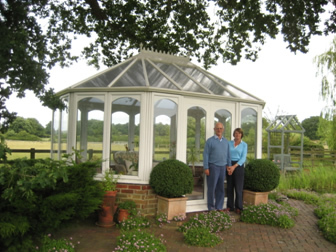 “My ideal was to have a conservatory roof that I could turn a hose on a couple of times a year to carry out all the necessary maintenance – and now that’s what I’ve got,” said a happy Mr Green. 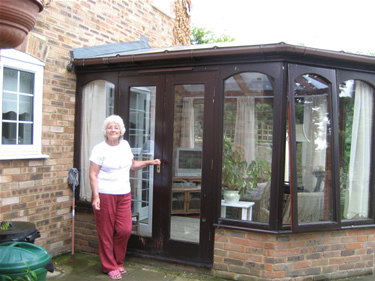 After: the completed HTG refurbished conservatory. “There’s no wood to rot and a clean over with a long-handled broom is all it takes. “The old roof had so many other draw backs. It was taking in water around the glazing bar covers. 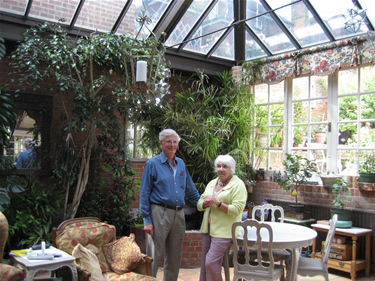 The conservatory was too cold in winter and too hot in summer. 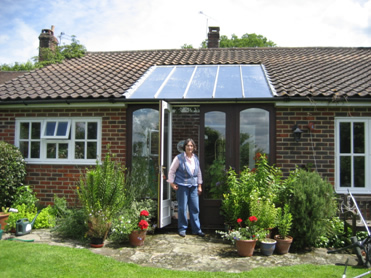 “HTG carried out the work in February and we could feel the difference straight away. “It was so much warmer. 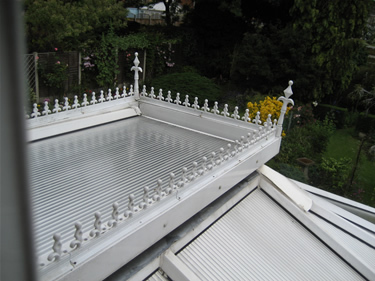 I used to have the radiator on in the conservatory and the door open into the house, but it was so cold all the windows used to steam up when I opened the door. But now I don’t need any heating on at all. 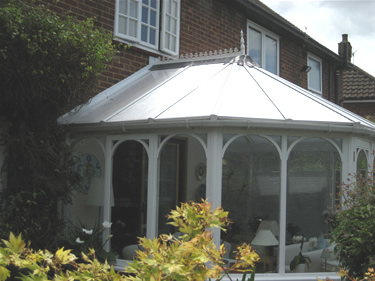 “The difference is so noticeable that before we didn’t use the conservatory much in the winter. Now I have my breakfast in it at 5am winter and summer. “And we also have so much more light now. The old roof was a gold colour that had got darker. The new HTG polycarbonate roof is so clear we can actually see the sky. And when we put small lights on at night-time they seem to reflect back into the room, again making it much lighter. “We asked local companies for quotes but didn’t like what they were offering. Then I saw an advert for HTG in a gardening book and got in touch. “HTG did a marvellous job. Two installers took just over two days; there was no fuss and no mess. HTG FACT: An HTG roof has the added benefit of being easy to clean. A hose and a ling-handled brush soon get rid of any detritus that may stick to the exterior of the roof.